I’ve been a fan of Pink Martini since seeing them perform at Seattle’s Crocodile Cafe in the late 90’s and yes, I do own every one of their cd’s. I’d always assumed the garden in “The Gardens of Sampson & Beasley” (click on the link to listen) was a fantasy, or maybe a combination of several real gardens along with a bit of poetic license. So imagine my surprise when I found out that it is a real place right here in Oregon and I got to visit! I was wearing flip-flops (of course) so I braved walking across the bottles. I'm not sure it would have been a good idea in heels. Walk a few feet and the look of the garden completely changes. A stream follows next to a pathway, through all sorts of recycled, rusty flotsam and jetsam. Well you're just not listening! And just like that we come to a rather abrupt end to a post that could have went on for another 100 or so photos, a girl has to draw the line somewhere! 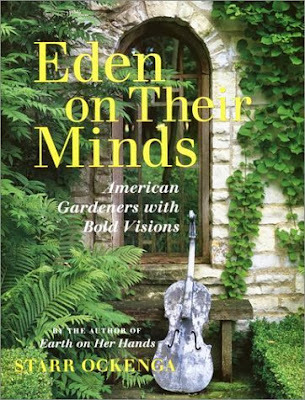 As a dessert course I offer this title: Eden on Their Minds, available used on Amazon for under $5. I was telling my friend Patricia about this visit and she remembered the garden, and Mr Beasley, were profiled in it's pages. It's a wonderful book full of beautiful photos and stories of gardens and their creators, I've only just begun to read through but can highly recommend it. Of the 20+ different gardens there are couple of other names I recognize (Linda Cochran, Marcia Donahue) and so many I can't wait to discover! 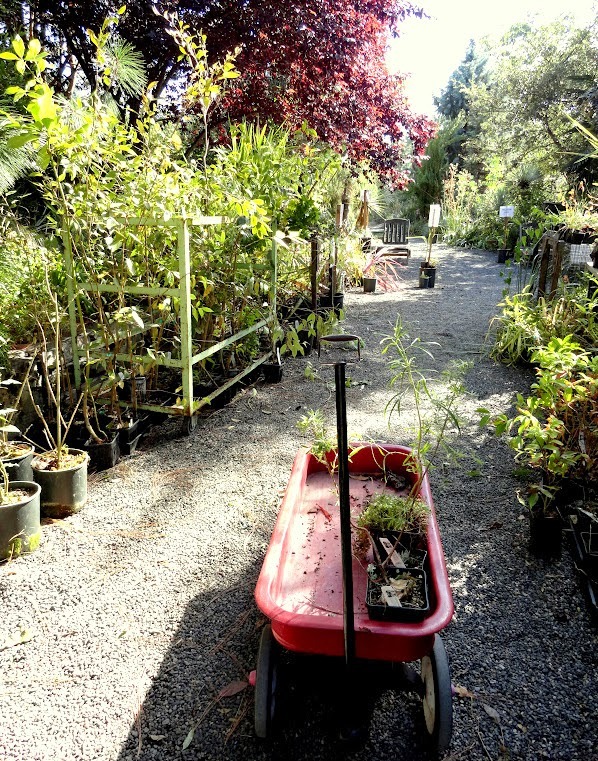 With my sincere apologies to anyone not within driving distance to Portland, Oregon, I simply must share my excitement about the plant sales going on here right now (or very soon)!!! Whew...that's a lot of great plant deals to be had! After walking down long hallways and narrow staircases we emerged into a small light shaft. And at the end of the hallway...green! I think we all breathed a small sigh of relief to see there really was a garden! This lush, quirky, space is the creation of Sean Stout and James Pettigrew, also known as the Organic Mechanics; a garden design, build and maintenance firm. They share this courtyard garden with the many residents of the multi-story buildings which surround it. This was a very personal garden, with repurposed elements throughout. Being in an urban courtyard setting their plant choices could push all the boundaries. I kept finding myself looking up in this garden, more than usual. I think it was knowing I was surrounded by tall buildings, but not quite believing it. That's either Sean or James, sadly I missed his talk about the garden (to busy gawking and yacking with other "flingers"). This point was sort of a pass-through to the sunnier side of things. I do feel a connection to those who garden in containers, whether from necessity or love. The early morning light fell on the Leucadendron argenteum perfectly. I took more photos of it than I would have thought possible, you only have to see two. It was Alison who asked if I'd been up to the roof to look down on the garden (I think she noticed I kept looking up). I hadn't! So she told me how to get there and off I went, just a little concerned the group would leave without me. What a view! Here's a neighbor who yearns for the outdoors but doesn't have a green thumb, or maybe the landlords permission to garden? I could see the group was still there so I felt okay hanging out for a few more minutes and imagining "what if..."
Eventually it was time to leave and I spotted the Mechanics truck in front of the building. Here's their info, in case you're in need of their services!